- HCE cleaning. 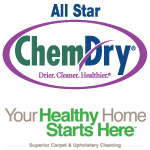 Price is based on the Healthy Home Cleaning Process and does not include stairs or rugs. - Not valid with other offers. Must present this Talk of the Town Coupon®.